What’s the difference? Nothing that we were ever able to determine. But no matter how you spell this wonderful pastry it always tastes good. 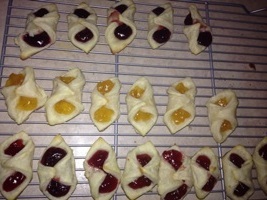 This recipe is one my daughter Dru, an excellent baker, adapted from my mother. It’s easy to make and hard to keep once the family gets to them. Blend all ingredients except filing in a medium-sized bowl. The trick to making tender kolackys is not to overwork the dough. If you do the pastry will be tough. Cover with cling wrap. Refrigerate for at least 2 hours, preferably overnight. Turn dough onto floured board and then roll out to less than ¼ inch thick. Cut dough into circles using the rim of a small glass. Lay ½ tsp. of filling on each circle. Gently overlap two sides to contain the filling. Bake 10 – 12 minutes or until light brown. By submitting this comment you consent to having this website store your name, email, IP address, and website if provided.